Ten years ago, if anyone would have told me that today I’d be considering higher levels of broadcast television (ABC/NBC/CBS/Fox) due to rapidly declining cable subscription levels, I might have given them a questioning side-eye. But this is increasingly the case. Cord-cutting is REAL and we need to find ways to adapt. Until recent years, satellite and cable subscriptions were on the rise as consistent development deals and better programming gave consumers higher-quality viewing options on networks previously considered second-tier. Now, better content is still being developed, but it is for such providers as Netflix, Hulu, YouTube and CBS All Access. Consumers have even more choices and, as a result, we must think differently about our TV buying strategies. This means a focus on purchasing real-time eyeballs and content over platforms. It also means a resurgence in viability and refreshed relevance for traditional broadcast television. 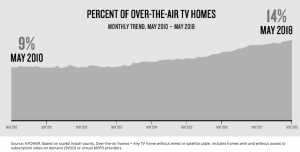 According to Nielsen’s TV panel (FEB 2019), one in every seven homes is now considered over-the-air (OTA) — up 48% from eight years ago. The rate of change has been steadily increasing since 2014. 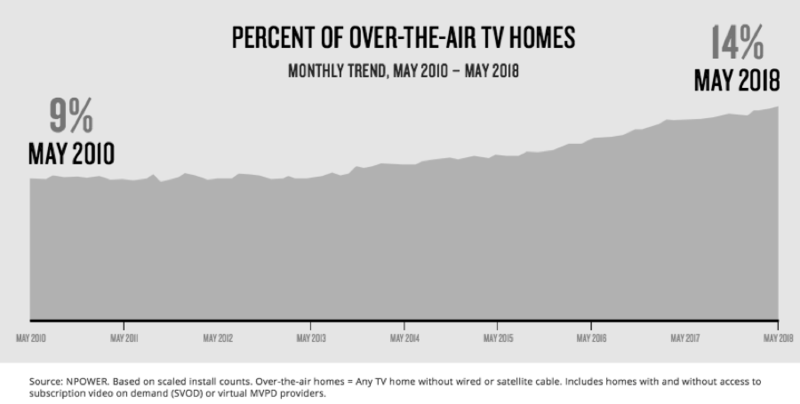 A huge takeaway here is the increased amount of traditional TV watched by OTA TV households — as evidenced by the graph below. As a country, we continue to average more than four hours of TV consumption per day (! 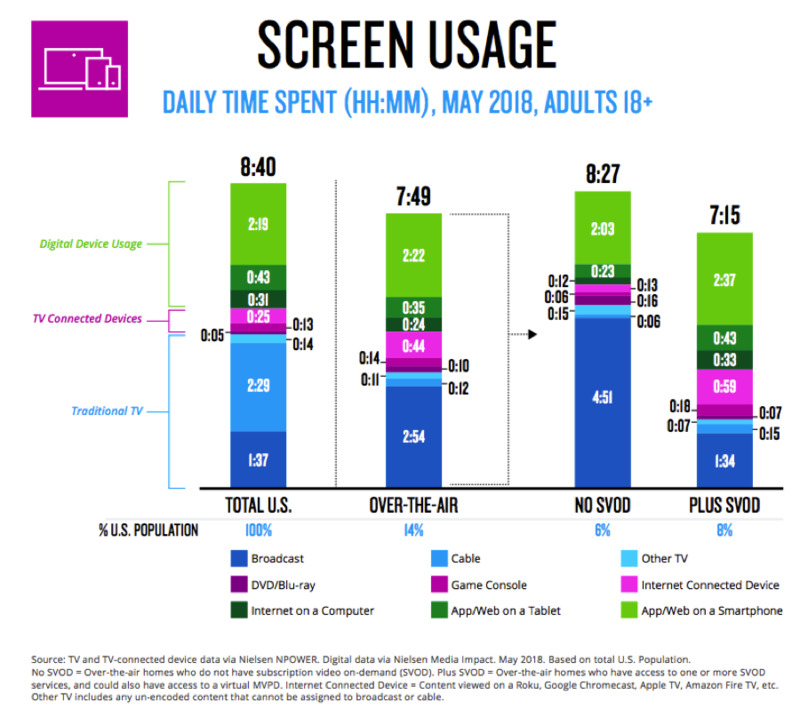 ), but the largest difference between the total U.S. viewing and OTA households is the amount of traditional broadcast TV watched by each group. 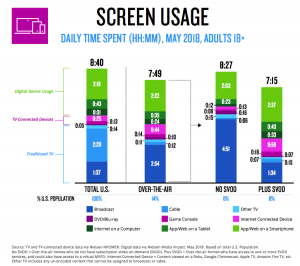 OTA broadcast viewing makes up nearly three hours of total time-spent for OTA households. That is 79% higher than the total U.S. average. So as OTA numbers continue to grow, so will broadcast viewing. Also noteworthy here is the amount of traditional broadcast television watched by homes that subscribe to video-on-demand services, such as Netflix (SVOD). These homes still watch roughly the same amount of traditional TV as the total U.S. — about 1.5 hours/day. SVOD services have not led to decreased viewing in any area outside of cable/other. This doesn’t just mean greater TV access to key demographics. It is also important to advertisers because this viewing is done live – not in playback. That translates to a higher overall exposure, more recall and even more real-time social engagement. This trend is a huge contributing factor to “The Bachelor” driving an average of 611,000 social interactions per episode in 2018 and to Tyra Banks pulling in 2.2MM social engagements for “America’s Got Talent” in 4Q18 (Source: Nielsen, 1/1/18–12/6/18). With all the noise and clutter in today’s marketplace, it becomes increasingly difficult for advertising messages to break through. This growth in OTA viewing illuminates a potential path for those brands. Let’s take a walk.